Some tools can make all the difference as you work. 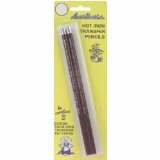 The Aunt Martha's Hot Iron Transfer Pencils (I found them here) are a must-have item! I recently had to add a small design to an embroidery piece and remembered I had them. I traced the back side of design firmly with the hot iron transfer pencil, and ironed it on the fabric where I needed it. Voila'! Easy to see lines, and quick method. Have you a new tool you can brag about? Let us know!!! I will have to try them! I was trying to transfer lines to a dark fabric and this would have helped a lot. Thanks for the idea! Olá,uso carbono amarelo(sou da moda antiga)não conheço essas maravilhas modernosas kkk. Este é um destes facilitadores das meninas prendadas.